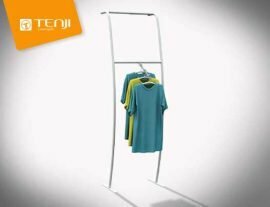 Tenji’s Steel Base Ipad/Brochure Stand is an incredible, dual purpose exhibition stand. This stand allows you to display your Ipad, so you can show off your brand in style using interactive apps. Or, if you don’t want to use an Ipad, simple fold down the mount. Then you still have an amazing brochure holder on it’s own. The Steel Base Ipad/Brochure Stand is super simple to set up and use. It uses simple click together technology for the strong aluminium frame. Once set up, the frame connects to the steel base using this same technology. The Steel base gives the Ipad Stand an incredible amount of stability. Once you have set up the frame, simple choose whether you want the mount up or down, then slide the fabric print on. The fabric print is made with Ultra-Stretch material to give you an incredibly tight, smooth finish. This stretch technology is sure to impress every potential clients that see it. The Ipad Holder that comes with the Steel Base Ipad/Brochure Stand easy clips over the mount, and secures to the stand with a screw on cap (see video below). The Holder is very straightforward to use. Simply adjust the size to fit your Ipad, then tighten it to the right size. Then you can attach the clips to the Sides of the stand, then sit the brochure holders over the clips. Then you can place whatever flyers or brochures you desire inside them. Alarm. You can attach the alarm so that if anyone tries to remove the Ipad then a loud Sound will immediately go off. Your stand can still be used as a brochure holder without the Ipad. Simply set it up the same way, with the Ipad mount down. 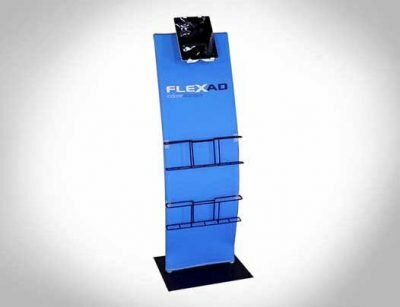 You can then utilise the stand to simply display any brochures or flyers you desire. All of these components pack up quickly into a lightweight, stylish carry bag. So not only is this stand amazing to set up and use, but it also makes transport a breeze. The Steel Base Ipad/Brochure Stand makes it super easy to interact with potential clients and customers at your tradeshow booth. 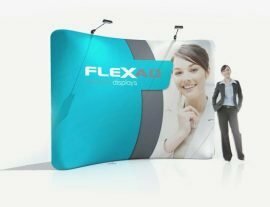 With its incredible design, ease of use and Multiple functions, this stand is the perfect addition to make your brand stand out.